Anyone who considers where their clean water comes from recognizes the critical role of infrastructure to deliver and maintain a safe and sustainable water supply for all users. Today we know much more about the systems and impacts involved in supplying and managing water; from headwater protection to stormwater management in urban areas, to flood mitigation and effective water treatment. There are also more options on the table for water management infrastructure. Part of this increase in alternatives includes conversations and actions around green infrastructure, including consideration of performance measures and cost effectiveness. Both green infrastructure and grey infrastructure can play an important role in water management in Alberta. However it is important to understand the differences and challenges these alternatives bring from economic, environmental, and social perspectives. What is green infrastructure and grey infrastructure? One of the challenges surrounding green infrastructure and grey infrastructure is a lack of clear, consistent definitions of the terms. Green infrastructure and grey infrastructure can both refer to work outside of water, such as buildings or transport; however, each of these can also impact water management. Green infrastructure is the “strategic use of networks of natural lands, working landscapes, and other open spaces to conserve ecosystem values and functions and provide associated benefits to human populations” (Allen, 2012) . Blue-green infrastructure is also a term used interchangeably with green infrastructure to describe things like rain gardens or reed beds that treat wastewater. Green infrastructure is generally decentralized; water is captured and treated where it falls, rather than being transported to a treatment facility. Green infrastructure terminology can also be used in the context of low impact development (LID). Blue infrastructure is a term sometimes used to describe the use of proprietary, small footprint, high-efficiency devices installed and retrofitted within existing water collection systems . Blue infrastructure can be used to connect the benefits of green and grey infrastructure, and is especially practical in challenging redevelopment environments such as tightly spaced urban areas. Blue infrastructure aims to mimic green infrastructure’s principles, for instance following natural drainage paths, and can serve as a grey infrastructure pre-treatment system or a space-efficient water treatment train . What are Blue Green Cities? Another emerging term regarding infrastructure in urban areas is Blue Green Cities. This is used to describe work that aims to recreate a naturally-oriented water cycle while contributing to the amenity of the city by bringing water management and green infrastructure together . Green roofs or rooftop gardens (City of Edmonton). 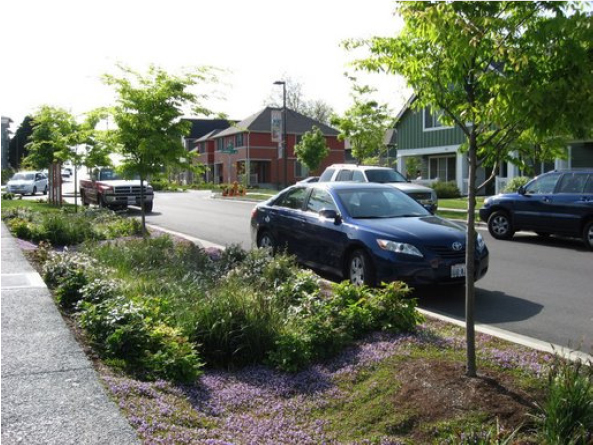 Roadside trees and permeable pavement are also examples of green infrastructure. Flood mitigation berms (High River). Compared to green infrastructure, grey infrastructure currently has a clearer asset life, depreciation, and return on investment. Challenges surrounding grey infrastructure include funding and public investment, maintenance, and increased urbanization. Urbanization presents a water management challenge because the introduction of more hard surfaces, like concrete or asphalt, contributes to higher volumes of stormwater runoff due to a reduction of infiltration. Due to its relative size, construction requirements, and finite life, grey infrastructure can also be seen as inflexible. Green infrastructure presents challenges in terms of measuring return on investment, risk management, and effectiveness in urban areas. 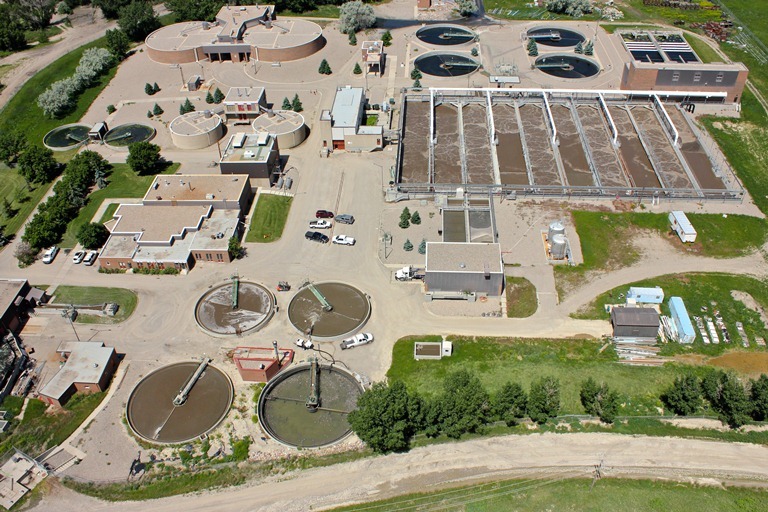 Current regulation—or absence of regulation—at the federal, provincial, and local levels also presents obstacles, as many green infrastructure projects don’t fit traditional wastewater treatment construction models, so they may not be standards or building/urban codes to govern how the projects should be implemented . As a largely untested concept, green infrastructure also faces scientific uncertainty, socio-political uncertainty/acceptance, and decision making uncertainty . Knowledge and experience for people making decisions and designing and operating green infrastructure presents challenges for traditional approaches. For instance, green infrastructure is thought of more as an urban design, due to the scale and dispersed nature of the works, compared to a large, engineering-focused infrastructure project. This is a broader metric developed to address the shortcomings of the Gross Domestic Product (GDP) as a measure of total wellbeing. It was first published in the late 1980s and has been vetted in scientific literature since that time . In a practical application example, the U.S. city of Baltimore used GPI to quantify the economic benefits of their Stormwater Management Plan. This preliminary analysis recognizes that more precise economic data on costs and benefits of programs will become available, and the analysis will be updated as a result. A copy of the Baltimore GPI Stormwater Report can be found here. The U.S. Center for Sustainable Economy and other partners developed the Green vs. Gray Analysis (GGA) which extends conventional public infrastructure analysis models to evaluate the cost effectiveness of technological solutions like new reservoirs. 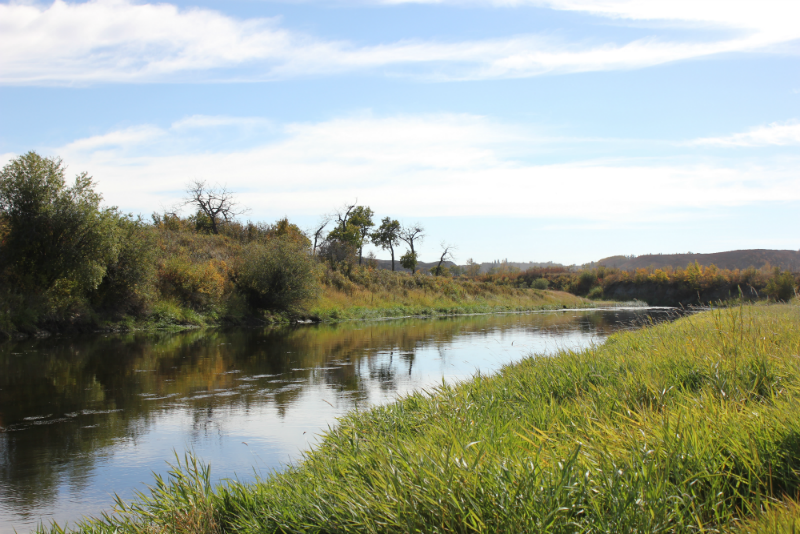 This is accomplished by factoring the unique role wetlands, forests, riparian zones, and other green infrastructure elements play in enhancing water quality and flow or achieving other environmental objectives. GGA is used to determine whether investing in these green infrastructure options is a more cost effective approach (or similar in cost) than grey infrastructure . The Natural Economy Northwest programme (U.K.) and partners developed this framework for assessing the potential economic and wider returns from investment in green infrastructure and environmental improvements . For more information, and to use the calculator, click here. This calculator by The Centre for Neighbourhood Technology (CNT) in the U.S. compares performance, costs, and benefits of green infrastructure and low impact development solutions for stormwater management. To view and use the calculator click here. Costs of infrastructure, either green or grey, include installation and capital costs, annual operation and maintenance (O&M) costs, opportunity costs, and transaction costs . Further, all types of infrastructure are associated with social costs and benefits, although these are universally hard to measure. Generally, there is no market-based evidence of fair value for water infrastructure assets, because of the specialised nature of these assets and the fact that they are rarely sold, except as part of a continuing business. Therefore, most water businesses estimate fair value based on the net present value (NPV) of expected incomes from the asset or on depreciated replacement cost . In this model a government service or private venture is funded and operated through a partnership of government and one or more private companies. In this long term financing option a private entity (who owns the works) receives concession to finance, design, construct, and operate a facility. This combines the requirements of the project (i.e. design, construction, operation, and maintenance) into one single contract, with funding from the public sector. For more information on different infrastructure models click here. As each project has its own funding and unique environmental considerations, it is impossible to broadly say grey infrastructure is (or is not) more cost effective than green infrastructure. The technology and tools exist to assess individual infrastructure projects; however, there is no consensus or consistent way to compare green and grey infrastructure investments. There are many existing case studies which indicate green infrastructure can be less expensive than grey infrastructure; however the longer term social, economic, and environmental impacts of green infrastructure may not be clearly known until further data and evaluation is made over the coming years. Two previous representative examples of green infrastructure return on investment are presented below. Selecting one of the examples above, the Chesapeake Bay Program (CBP) is a longstanding partnership to improve water quality and ecosystem health in the Chesapeake estuary and is the U.S. EPA’s flagship model for its National Estuaries Program. As of 2016, the program is working toward the implementation of over 100 short and longer-term goals and actions broken-down into the areas of species/habitat, clean water, climate change, land conservation, and community engagement. There is a unified monitoring program to evaluate progress against the key goals and indicators. The program reports that, over the long term (1985-2013), 55 percent of monitoring sites have shown improving trends in nitrogen concentrations . However the impacts of the program are currently not solving all water quality issues, it’s reported “water quality remains very poor. Too much pollution flows to the Bay and its streams, creeks and rivers” . In 2007 the U.S. Environment Protection Authority published a report, Reducing Stormwater Costs through Low Impact Development (LID) Strategies and Practices. This report was the result of a green infrastructure study which focused on Low Impact Development (a stormwater management strategy used to reduce runoff and pollutants in the water by managing it as close to its source as possible) . “In a few cases, LID project costs were higher than those for conventional stormwater management practices. However, in the vast majority of cases, significant savings were realized due to reduced costs for site grading and preparation, stormwater infrastructure, site paving, and landscaping. Total capital cost savings ranged from 15 to 80 percent when LID methods were used, with a few exceptions in which LID project costs were higher than conventional stormwater management costs” . There will always be a requirement for grey infrastructure to guarantee water quality for drinking, treatment of high volumes in small areas, and water transportation. However, depending on the specific localized conditions and objectives, green infrastructure may complement grey infrastructure to help reduce energy costs and create more livable cities for the future. Canada is recognizing the value of a hybrid approach to water issues such as stormwater management. For example, green infrastructure can reduce the pressure on grey infrastructure through naturally filtering out non-point source pollutants. Awareness of the various options available to tackle individual scenarios and localized environments is growing throughout the water industry, watershed and environmental organizations, and all levels of government. Have a question or comment about green or grey infrastructure you’d like us to investigate?